Download "Product Manual. 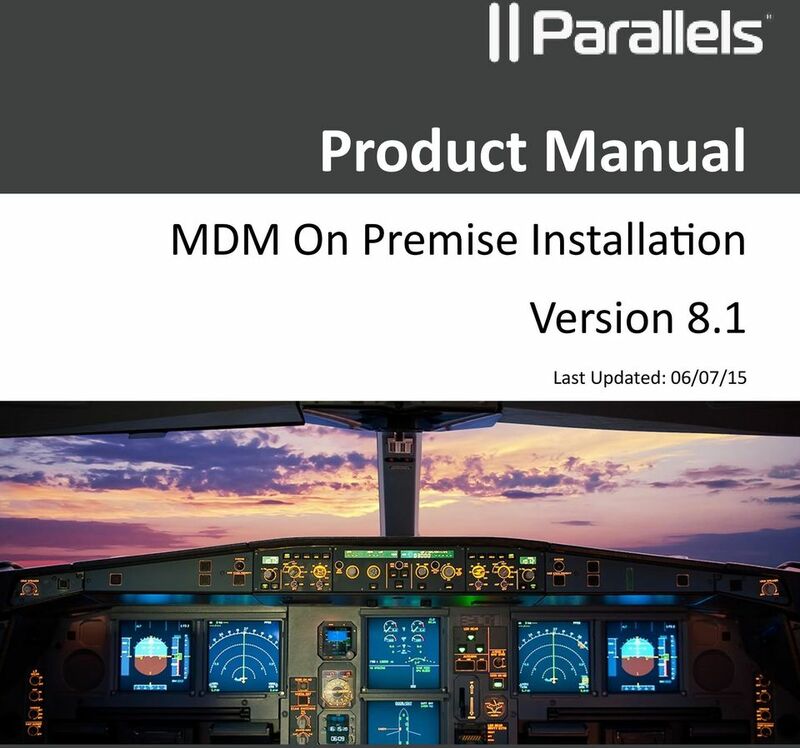 MDM On Premise Installation Version 8.1. 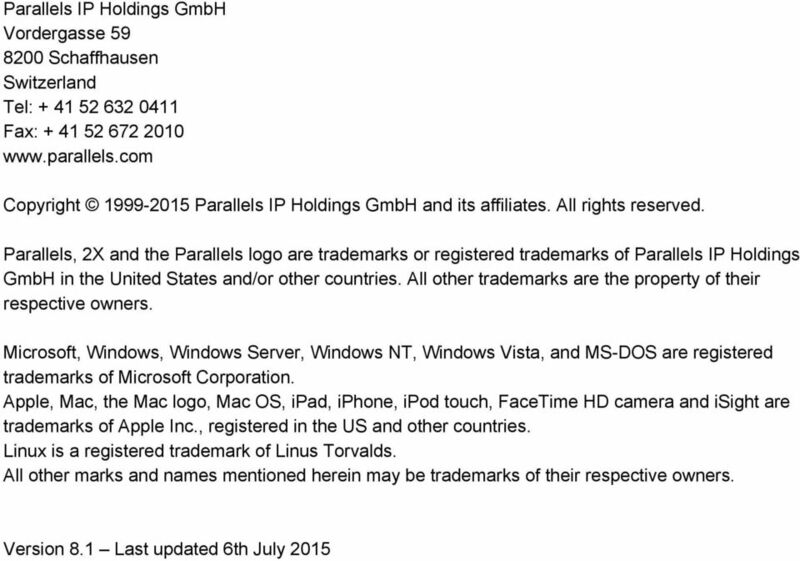 Last Updated: 06/07/15"
5 device enrollment ser vice ndes in active directory certificate services ad cs.aspx 2. 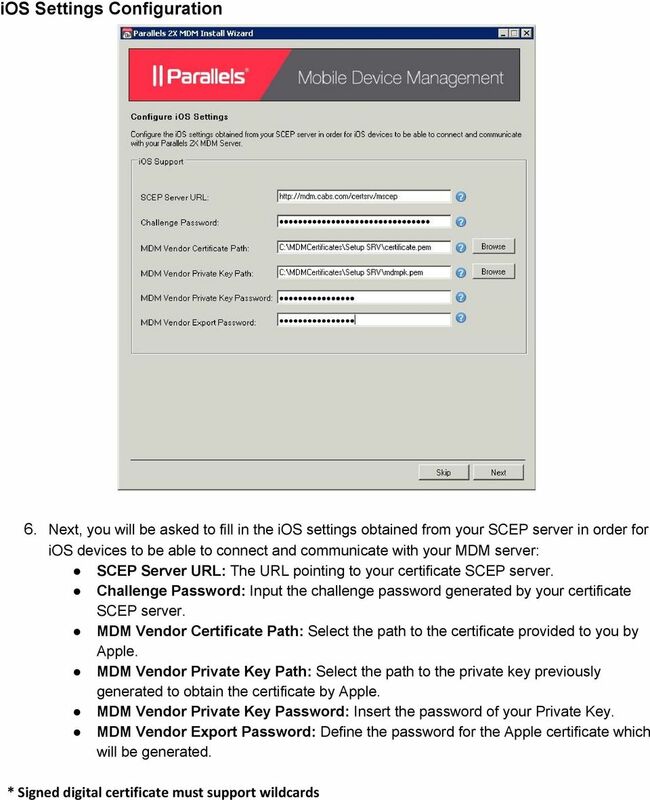 An Apple Enterprise Account An Apple Enterprise Account is required in order to obtain the necessary MDM Vendor Certificate provided by Apple in a.pem format. More information can be found at the following link: IMPORTANT NOTE: All Certificates should be located in a folder that grants full access at least to the IIS users group (IIS_IUSRS) and SYSTEM. It is also highly recommended that all certificates are saved on a physical drive connected to the MDM Server machine (ex. under the C:\ directory). 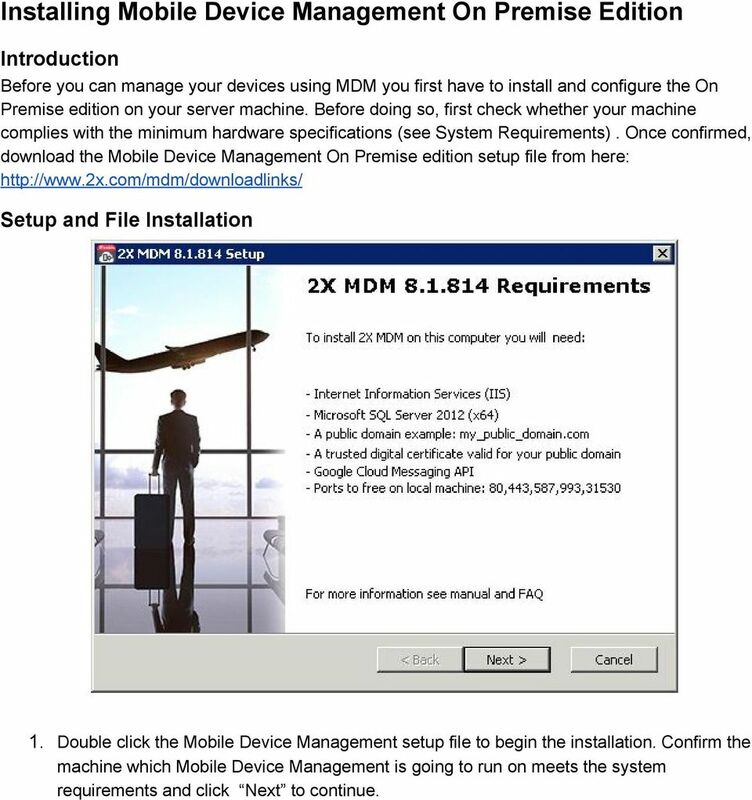 6 Installing Mobile Device Management On Premise Edition Introduction Before you can manage your devices using MDM you first have to install and configure the On Premise edition on your server machine. Before doing so, first check whether your machine complies with the minimum hardware specifications (see System Requirements). Once confirmed, download the Mobile Device Management On Premise edition setup file from here: Setup and File Installation 1. Double click the Mobile Device Management setup file to begin the installation. Confirm the machine which Mobile Device Management is going to run on meets the system requirements and click Next to continue. 7 2. 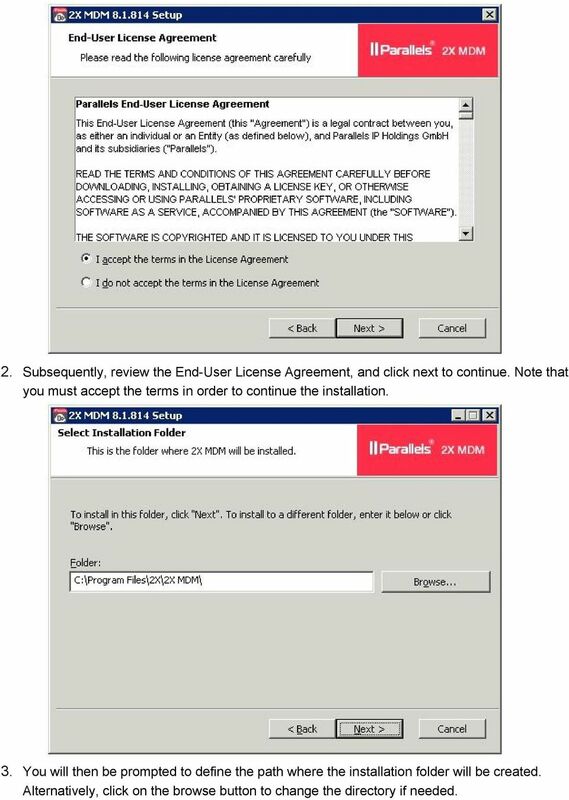 Subsequently, review the End User License Agreement, and click next to continue. Note that you must accept the terms in order to continue the installation. 3. You will then be prompted to define the path where the installation folder will be created. Alternatively, click on the browse button to change the directory if needed. 8 4. Click Install to confirm the previous steps and start the installation process. 5. 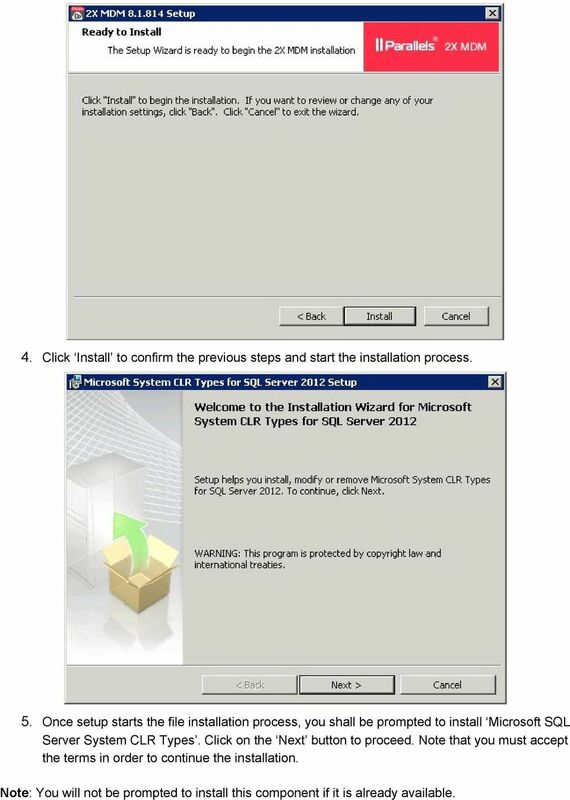 Once setup starts the file installation process, you shall be prompted to install Microsoft SQL Server System CLR Types. Click on the Next button to proceed. Note that you must accept the terms in order to continue the installation. Note : You will not be prompted to install this component if it is already available. 9 6. Further define the machine administrator and company name, click Next and subsequently Install to confirm and start the installation process. The installation process shall complete and the Mobile Device Management On Premise edition installed on your server machine. 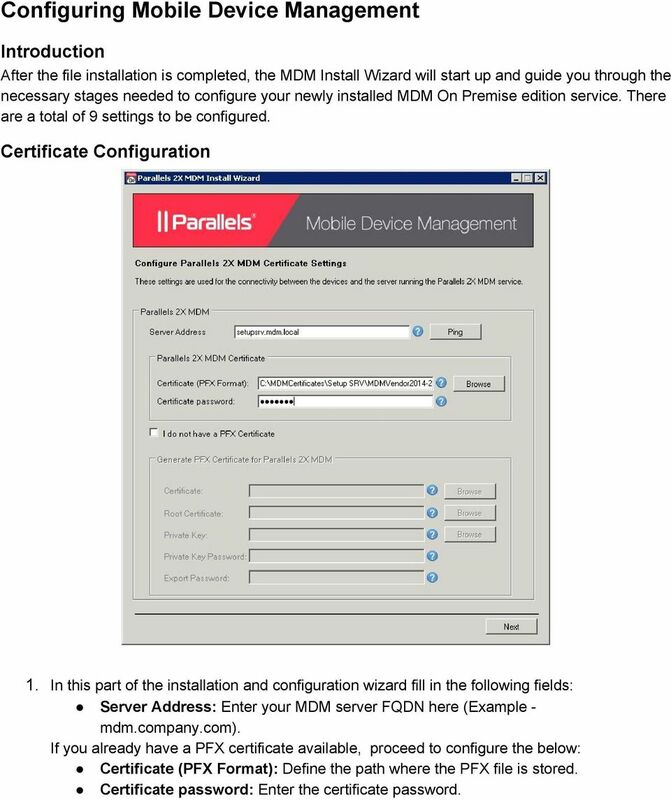 10 Configuring Mobile Device Management Introduction After the file installation is completed, the MDM Install Wizard will start up and guide you through the necessary stages needed to configure your newly installed MDM On Premise edition service. There are a total of 9 settings to be configured. Certificate Configuration 1. 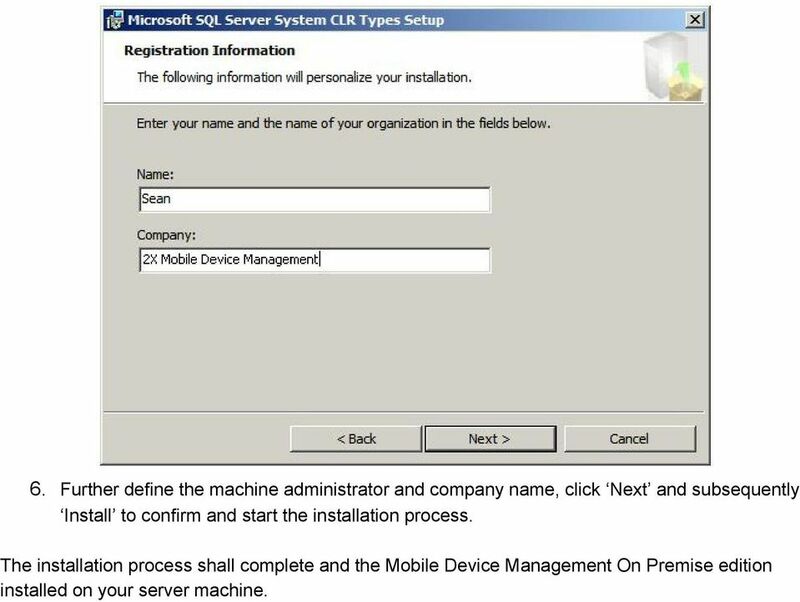 In this part of the installation and configuration wizard fill in the following fields: Server Address: Enter your MDM server FQDN here (Example mdm.company.com). If you already have a PFX certificate available, proceed to configure the below: Certificate (PFX Format): Define the path where the PFX file is stored. Certificate password: Enter the certificate password. 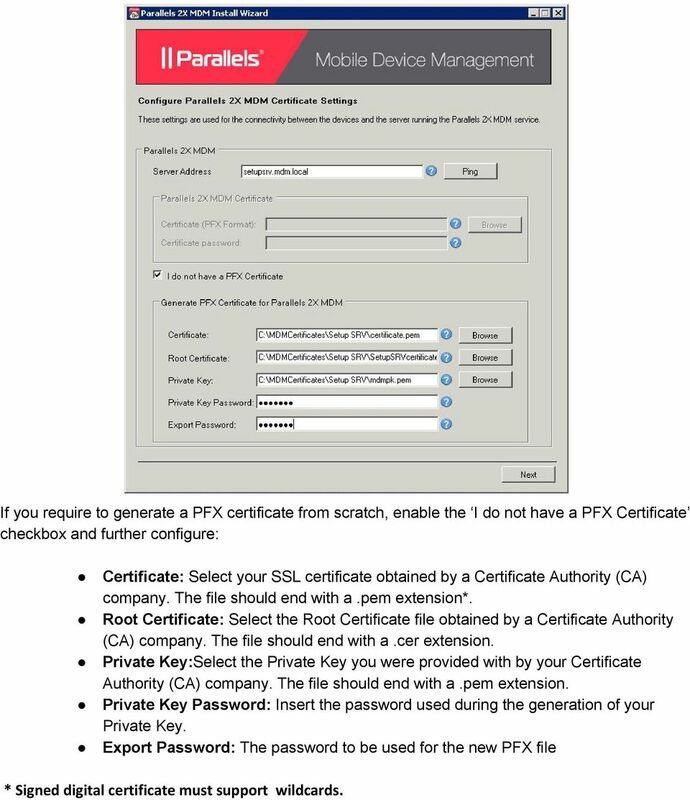 11 If you require to generate a PFX certificate from scratch, enable the I do not have a PFX Certificate checkbox and further configure: Certificate: Select your SSL certificate obtained by a Certificate Authority (CA) company. The file should end with a.pem extension*. Root Certificate: Select the Root Certificate file obtained by a Certificate Authority (CA) company. The file should end with a.cer extension. Private Key: Select the Private Key you were provided with by your Certificate Authority (CA) company. The file should end with a.pem extension. Private Key Password: Insert the password used during the generation of your Private Key. Export Password: The password to be used for the new PFX file * Signed digital certificate must support wildcards. 12 Database Configuration 2. In the Database Settings dialog window, fill in the following: Location: Specify the IP address of the machine hosting your SQL database. If the database is located on the same machine you are installing Mobile Device Management, you can also use localhost. Password: Fill in the password of your SA database account. Note: Click Test Connection to confirm the MDM server is able to connect to the configured database. 13 3. During this process the installer will start performing the following operations: Generate the PFX certificate. Create the database users. 14 Configuration 4. Next, you shall be requested to fill in the Settings to be used by MDM. SMTP Server: Fill in the SMTP server to be used. Port: Fill in the port number to be used for sending out s. Fill in the address that you want to be shown when s are sent out. Username: Fill in the username to be used if the mail server requires authentication. Password: Password for the username provided if the mail server requires authentication. Use Secure Connection: Tick this box if your SMTP server requires an SSL connection. 15 SMS Settings Configuration 5. 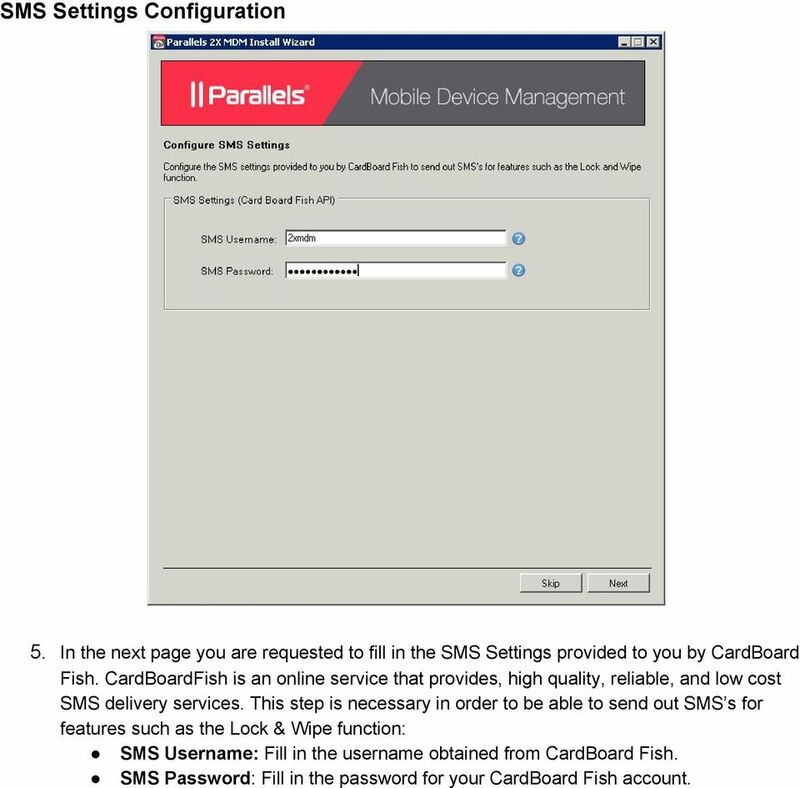 In the next page you are requested to fill in the SMS Settings provided to you by CardBoard Fish. CardBoardFish is an online service that provides, high quality, reliable, and low cost SMS delivery services. This step is necessary in order to be able to send out SMS s for features such as the Lock & Wipe function: SMS Username: Fill in the username obtained from CardBoard Fish. SMS Password : Fill in the password for your CardBoard Fish account. 17 Google Messaging Settings 7. In the next dialog window you are asked to fill in the GCM settings obtained from your Google Cloud Messaging project. This is used to send PUSH notifications to Android devices. Project Number/ GCM API Key: Insert the Project Number obtained by the Google Cloud Messaging project. API Key/ GCM Project Id: Insert the API Key obtained by the Google Cloud Messaging project. Note: The GCM Project Id is also known as the Project Number. Extract this number from the Google Developers Console > API Project > Overview > Project Number (Top Left Corner) as shown below. 18 BackOffice Account Configuration 8. 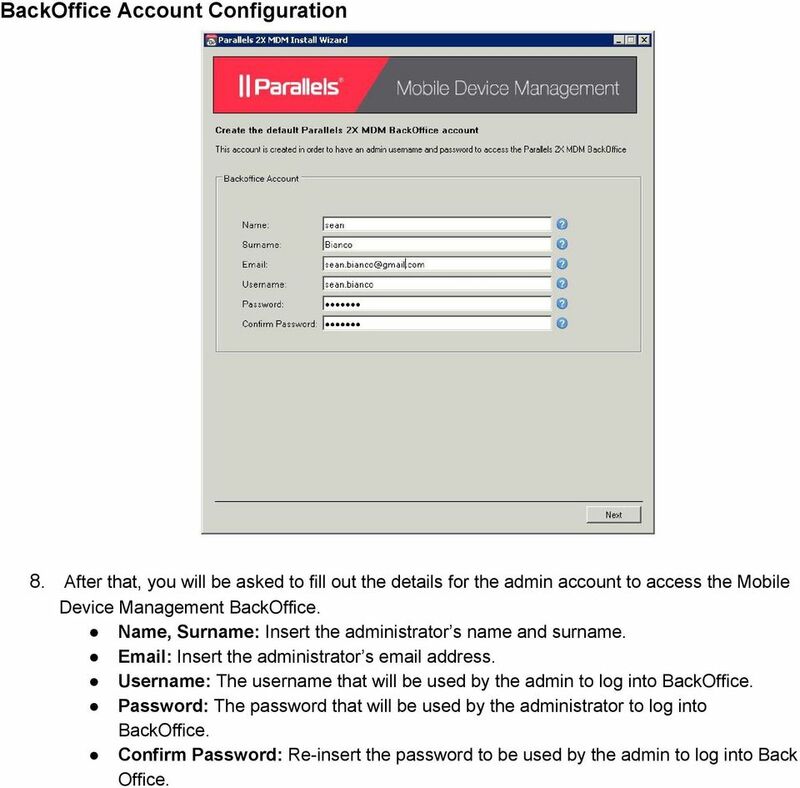 After that, you will be asked to fill out the details for the admin account to access the Mobile Device Management BackOffice. Name, Surname: Insert the administrator s name and surname. Insert the administrator s address. Username: The username that will be used by the admin to log into BackOffice. Password: The password that will be used by the administrator to log into BackOffice. Confirm Password: Re insert the password to be used by the admin to log into Back Office. 19 SQL Server Reporting Service Configuration 9. Next, you will be asked to enter SSRS settings required by setup to deploy SSRS configuration for MDM and also generate reports. Upon completion click Next to initialise final setup. Web Service URL : The URL pointing toward your Reporting Services end point. 20 Portal User credentials are required to authenticate connections from the MDM portal when generating reports. If the SQL Server Reporting Services (SSRS) is not installed on the same server that MDM setup is running on, enable the Portal User Credentials checkbox and configure the below: User Login and Password: Enter Windows credentials that are configured in SSRS with browser permissions. Note : If Setup is running on the same machine SSRS will automatically be configured to authenticate credentials from the MDM portal. 21 Administrator credentials are required to deploy MDM report configuration to SSRS. If the administrator you are currently logged in with does not have administrator privileges and content management rights in SSRS, enable Use the credentials below : Administrator Login Name and Password: Enter Windows account credentials configured with administrator privileges and content management rights in SSRS. Note : If setup is running on the same machine as SSRS, administrator rights are automatically authenticated. 22 10.Finalise the installation by clicking finish and optionally select to launch Mobile Device Management upon completion. 24 2. 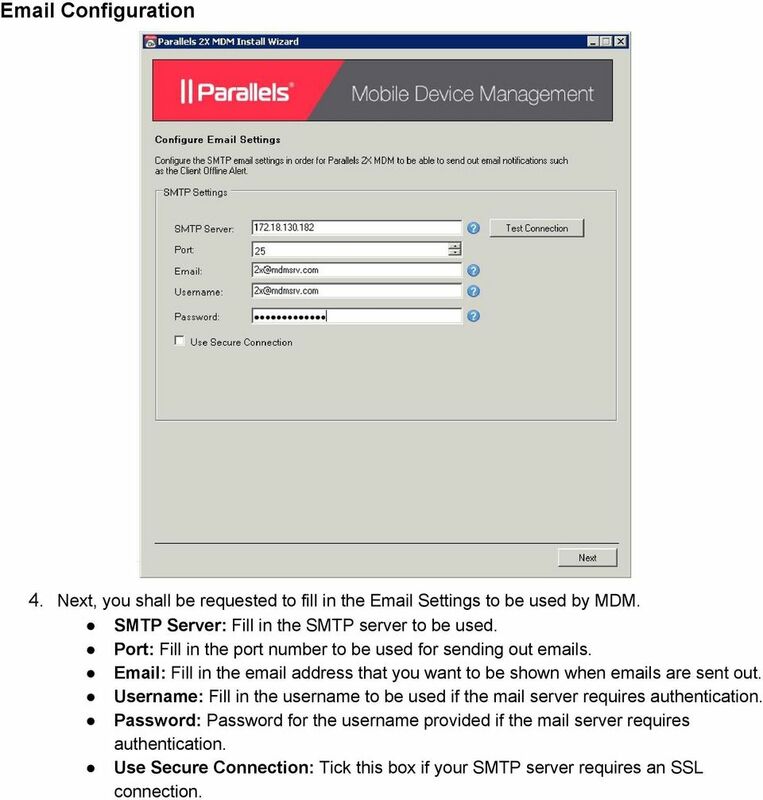 You are now able to access the Mobile Device Management administration pages through the following URL s: MDM Domain>/signup Used to create accounts in order to further assign and manage your devices. MDM Domain> Used to log into your account, assign devices and further manage them. MDM Domain>/backoffice Used to log into the backend of the system and manage the accounts and change system configuration settings. 25 Accessing BackOffice Accessing and Configuring Your BackOffice 1. 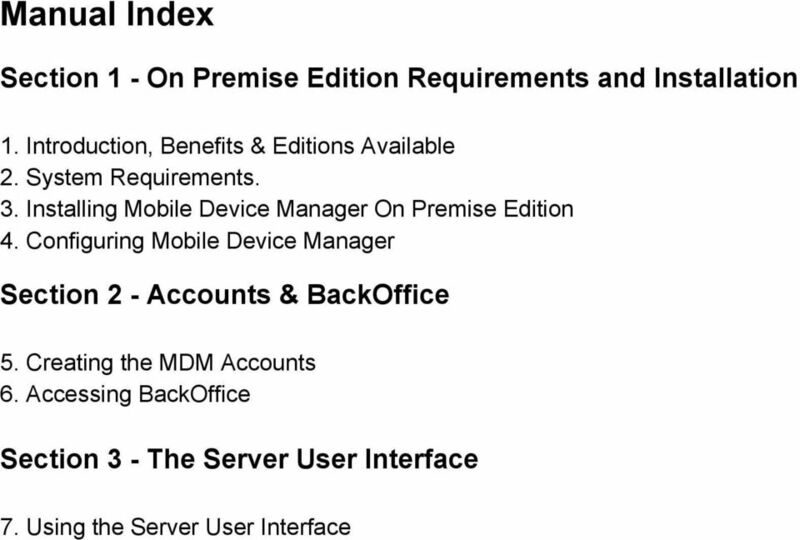 To access the BackOffice of your MDM system, you need to access: MDM Domain>/backoffice 2. Fill in the Username and Password provided previously in step 8 of chapter 4 (Configuring Mobile Device Manager) to access your BackOffice. 3. From the BackOffice you can add additional users, assign them permissions to perform the actions below and even specify IP s that BackOffice access is allowed from per user: Account You can view, disable, enable, delete or administer existing accounts created through the MDM Domain>/signup Administration You can view, add and delete users and groups which can access this Mobile Device Management BackOffice Portal. 26 Add a BackOffice User To add a user and assign the permissions discussed in the step 3, click Add and configure the below: Basic Information : Fill in user details such as name, surname, address and the username and password used to access BackOffice. Access Locations : Select IP s (added from Access Locations ) the user is able to access BackOffice from or allow access from all. Permission Groups : Select the Group (added from the Groups ) this user will inherit permissions from. Custom Permissions : Enable the Custom permissions below to the user: Manage Accounts : User can view, disable, enable, delete or administer existing accounts. Manage Support Users : User can view, add and delete users and groups which can access this Mobile Device Management BackOffice Portal and even specify the Access Location IP s. In addition, Dashboard displays the total number of activated accounts, inactive accounts, devices currently connected and devices currently registered on the system, Groups allows you to add new or already existing groups and from Access Locations, specify IP s that BackOffice access is allowed from. Note : Groups and Access Locations specified will show up on new users configuration window. 27 Reports The Parallels 2X backoffice provides reports via the reports node: MDM Device Transactions this report provides an overview of activity between the MDM server and devices on all accounts including the ID or unique command identifier, the textual description of the command, the amount of these commands sent, the commands which were processed by the device and the overall percentage of pushed vs serviced commands. 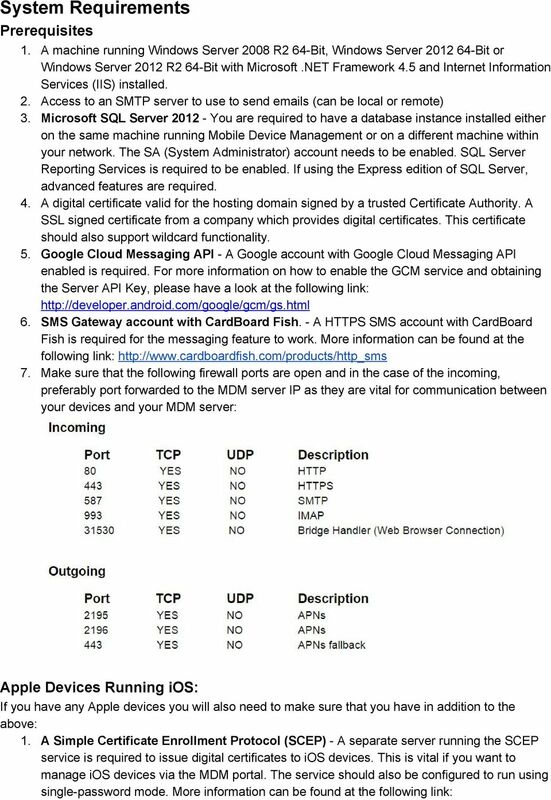 MDM Server Activity presents inventorial data about devices connected to the MDM server from all accounts. Information produced in this report include total active devices by operating system, total active accounts, number of new signups, account signups by source (Play Store, Website etc. ), new accounts activity (number of accounts categorized by number of devices enrolled), total active devices by operating system version, total active devices by client version. Each report can also be exported and downloaded in the following formats: CSV, PDF, MHTML, Excel, Word and TIFF. Note: The Reporting node requires that SSRS is configured from the Server User Interface > Reports. 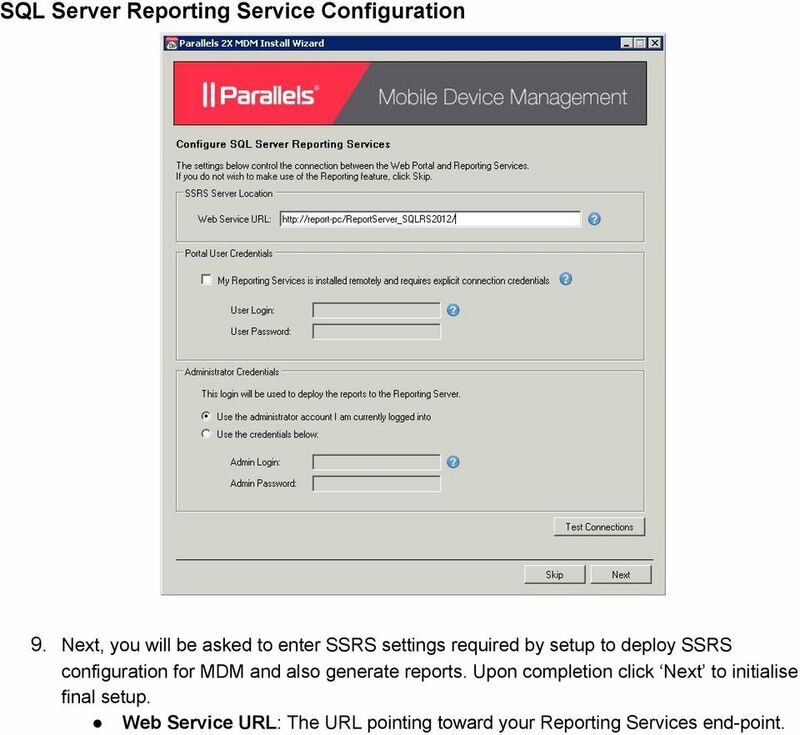 28 Managing the Server User Interface The Parallels 2X MDM On Premise Edition installation has successfully completed, MDM accounts created and devices connected. 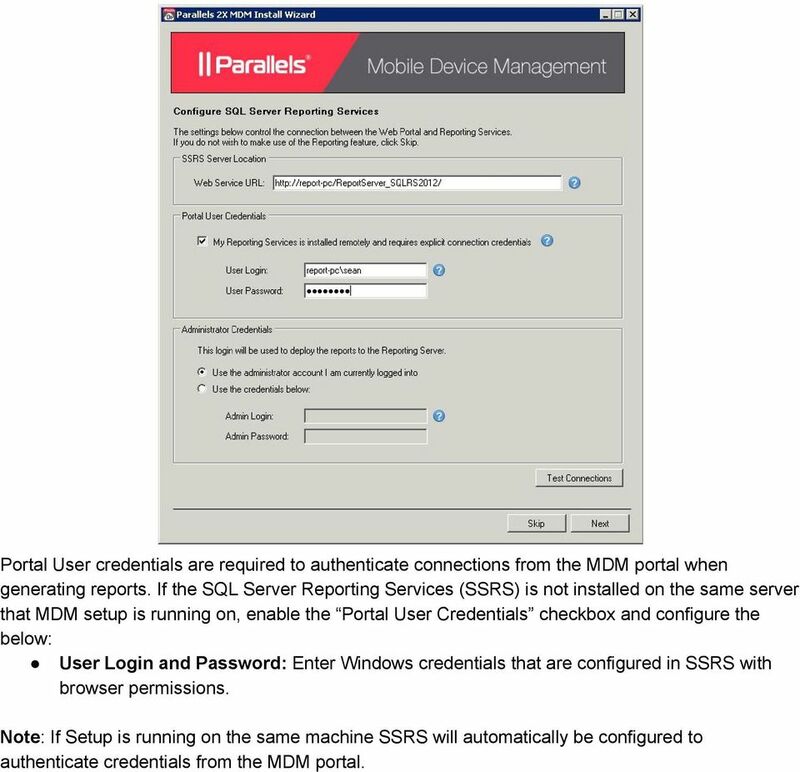 The backend of Parallels 2X MDM, also known as the 'Server User Interface' consists of 10 tabs used to monitor, maintain and update MDM configuration and processes configured during the installation process including a few additional options. 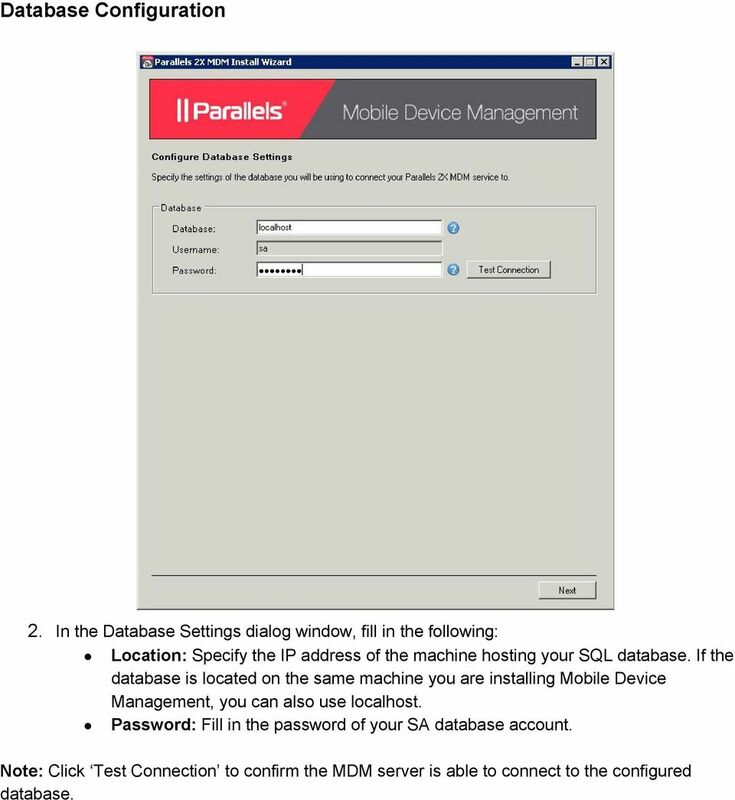 Access the Server User Interface from the server Parallels 2X MDM is installed on > click the 2X MDM Program Group > click 2X MDM Server'. 1. Status Tab The Status tab lists the Parallels 2X MDM services, how long they have been running for and also allows for each individual service to be stopped and then started again: Device Server: Handles all communication between devices and the MDM Server. Background Services: Handles tasks which include notification, SMS messaging, Push notifications etc. (review 2. Status Tab for full description) Bridge Server: Handles Remote Control sessions via internet connection The server logs listed are extracted from the Windows Event logs and are useful for investigating behavior on the system. 32 5. Map Tab Next, the Map tab allows you to configure which maps provider location updates will be resolved to and displayed on from the MDM portal. Select the map provider you have registered with from the Provider dropdown and enter the related API key in the Provider API Key text field. If Bing maps is selected, optionally also enable the Use Microsoft Maps Background resolver service to resolve location points without an address. 33 6. Messaging Tab This tab consists of settings required for both STMP and SMS message notifications to be sent by Parallels 2X MDM. These settings were configured during setup. From the SMTP Settings section you can adjust the settings below: Server: The SMTP server IP address or FQDNto be used. Port: The port number to be used for sending out s. The address that you want to be shown when s are sent out. Username: The username to be used if the mail server requires authentication. Password: Password for the username provided if the mail server requires authentication. Use Secure Connection: Tick this box if your SMTP server requires an SSL connection. From the SMS Settings section configure the below: Username: Fill in the username obtained from CardBoard Fish. Password : Fill in the password for your CardBoard Fish account. 34 7. 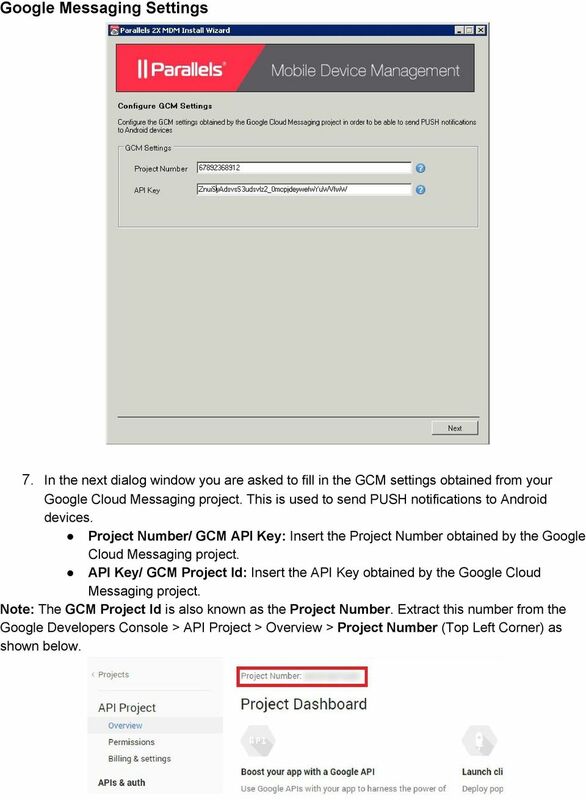 Android Tab For MDM to communicate with GCM and send PUSH notifications to Android devices, configure or update the configuration options below: Project Number: The project number obtained by the Google Cloud Messaging project. API Key: The API Key obtained by the Google Cloud Messaging project. 37 10. Reporting Tab You can alter the configuration options defined during the setup process used both to deploy and generate reports. The configuration options are listed below: Web Service URL : The URL pointing toward your Reporting Services end point. Reporting Access: Toggle the reporting feature for the back office and admin portal. Portal User Login and Password: Enter Windows credentials that are configured in SSRS with browser permissions. Administrator Login Name and Password: Enter Windows credentials configured with administrator privileges and content management rights in SSRS. 38 The Advanced button allows you to define the database that will be used to generate reports. The Override Reporting Data Source option is typically enabled when the mdm database that reports will be generated with is mirrored on another server. If required, enable this feature and configure the below: Database Server : Specify the IP address of the machine hosting the mirrored SQL database Database Name : Specify the mirrored database name Database Username and Password : Mirrored Database credentials Show message in reports node : Set the value in hours equal to the mirrored database update interval used to alert administrators in the portal that report data may be as old as the value set. Note : Setting the reporting Data Source to a mirrored mdm database takes load off the live database. Installation Guide ARGUS Symphony 1.6 and Business App Toolkit. 6/13/2014 2014 ARGUS Software, Inc.
Table of Contents Introduction... 4 System and Hardware Requirements... 4 Supported Operating Systems... 4 Microsoft SQL Server... 4 Microsoft.